You can do a lot with ColorTone premixed guitar finishes in aerosol cans! 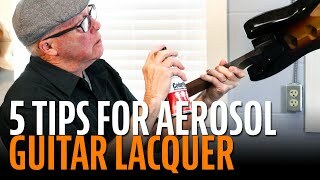 Dan Erlewine shares the secret to good guitar finishing using spray cans. 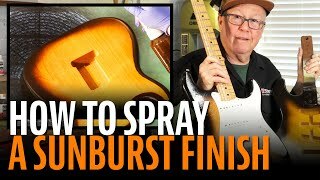 Finishing recipe from Dan Erlewine: Dan shows how to mix up the amber and brown-black colors that recreate one of the favorite sunbursts seen on early Fenders! 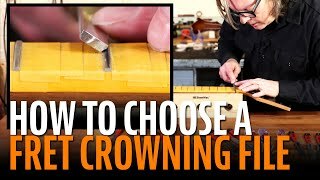 With so many fret crowning files on the market how do you choose? Which one is the "best"? 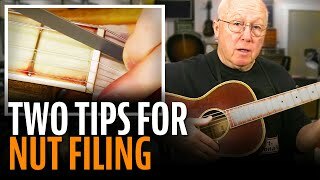 It depends on a lot of factors, how skilled are you at doing fret work, what's your budget, is this a hobby or are you doing repair work for money? In this Trade Secret Erick demonstrates each of the major types of files and shares tips that'll help you decide which file is right for you. 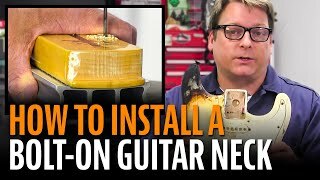 One of the best upgrades you can make to your import guitar is replacing the factory installed plastic nut with bone or another high quality alternative. This week Dan and Paul illustrate a fast, easy way to replace a nut in a Fender Squier Bullet Stratocaster. The job is fast, requires almost no tools, and anyone can do it. 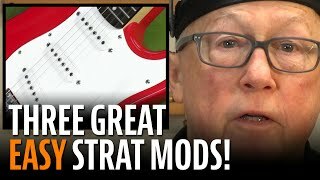 3 Easy Mods to Make Your Fender Squier Stratocaster Play Great! Dan Erlewine shares 3 simple mods that'll make your Fender Squire Stratocaster play great. Upgrade your tuners, improve the string angle at the nut, and save your picking hand from a lot of pain at the bridge! 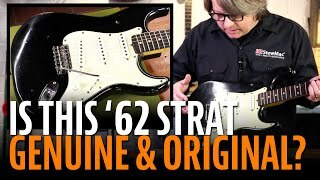 This is a genuine 1962 Strat, but how much of it is original? It's been refinished, and a refin has a big impact on the value of a vintage guitar. What else about this Strat has been changed? Erick Coleman shows how he figured this out. This 1956 Telecaster was just refretted. That calls for a new taller nut, but Dan Erlewine just didn’t have the heart to throw out it’s beautifully aged original nut. So he came up with a clever solution! 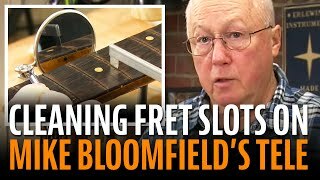 Dan Erlewine's making a Christmas present: Modifying a neck rest to hold cut frets for fret jobs. This handy benchtop helper is easy and quick to make. Todd Rundgren’s "Foamy": should I refret it? 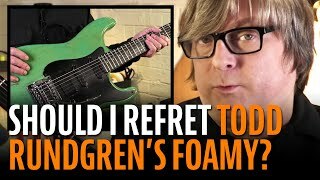 Todd Rundgren's guitar "Foamy" is in Erick Coleman’s shop for a... refret? That's the question. Erick considers whether the best solution is new frets or removing the wear from the ones in place. Small dents happen all the time, and often they can be undone with a soldering iron and a damp rag. Dan Erlewine shows how it's done. Warping happens! 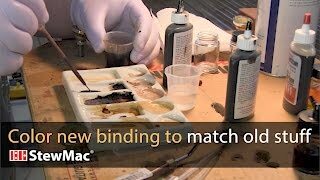 Dan Erlewine has two bookmatched pieces that he needs to join into one. 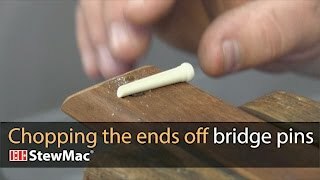 Even though they’re warped, Dan shows how he joins them with a good flush glue joint. Mamie Minch's Uke-building Camp for young girls! 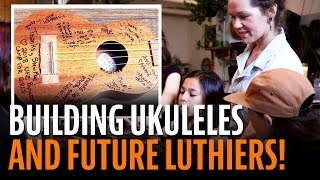 In July 2018, Mamie Minch of Brooklyn Lutherie hosted a week-long ukulele-building camp for young girls in New York City. This “super shop class” gave these youngsters the tools and guidance to build and play their first instrument! 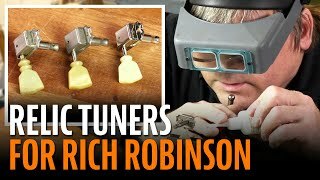 Rich Robinson of The Magpie Salute and founding member of The Black Crowes asked Erick Coleman to install tuners that match this Gibson’s original factory machines. 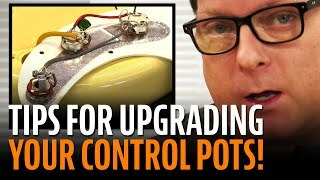 Erick shows how he made the new tuners look as old as the guitar. Installing an endpin jack means creating an oversize endpin hole. 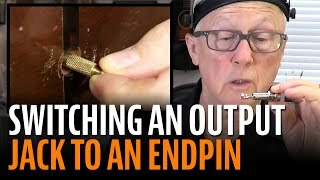 So what happens when you want to go back to a regular endpin? Dan Erlewine’s got a solution. The elephant-ear tuners on this '72 P-Bass are barely turning at all. 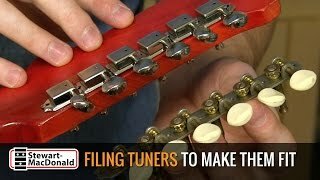 Instead of installing new tuners, Dan Erlewine shows how to get the original tuners working again. This 1972 P-Bass neck came into Dan Erlewine's shop with a nasty curve that wouldn't adjust out. Dan had to remove wood to make it straight, so now he's refinishing the surface to match the rest of the neck. 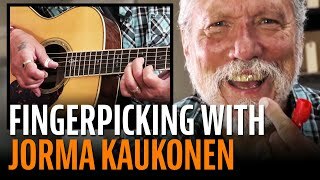 After Dan Erlewine put new tuners on Jorma Kaukonen's Martin M-30, Jorma returned the favor by giving an impromptu lesson in fingerpicking! He also shows how he strings up his Martin. 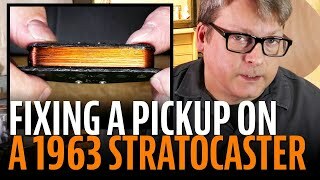 Conquering an UNDEAD Strat pickup! This pickup is a zombie. Even though it has died, it's still making sound. Erick Coleman identifies the problem, and we watch him ever-so-carefully tear the pickup down and rewind it. Steve is an apprentice in Dan Erlewine’s shop, and he’s planning to build himself a copy of Dan's 1930s Kalamazoo K-11. Here's his simple and accurate way to create a body template. OUCH! Somebody really yanked the frets out of this 1952 Gibson Les Paul. Dan Erlewine and Paul Lampley repair these potholes with super glue and rosewood dust. Somebody stripped the peghead of this 1957 Gibson J-50 to bare wood. Restoring it means replicating the original logo. Dan Erlewine’s got a neat tip for spraying a factory-quality logo. 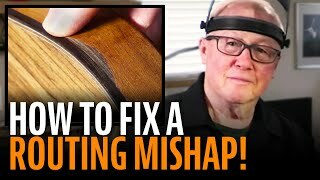 Routing for guitar binding: fixing a mistake! OUCH! Luthier Brock Poling was routing for binding on this custom guitar when the router grabbed it and threw it against the wall! Suddenly this build became a repair, and he talks with Dan Erlewine about how to fix it. Someone made a really odd attempt at repairing braces inside this Gibson 12-string. That didn't keep the top from twisting into a wave shape. Dan Erlewine shows a simple fix. 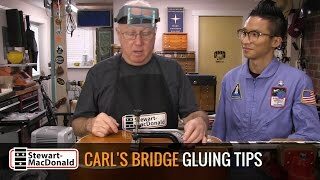 Dan Erlewine’s 2-minute bridge gluing challenge! Working fast! Dan Erlewine’s using hot hide glue to attach this bridge. It means working fast while the glue’s hot. Susan, our videographer, gives Dan a two-minute challenge: BEAT THE CLOCK! What's wrong with this Fender truss rod? Truss rod breaks almost always happen at the adjusting nut. Not this time. Dan Erlewine has a Fender neck in which the entire truss rod rotates along with the nut. It seems to have come apart in a really unusual way. What’s so great about hide glue? What’s so great about hide glue? Dan Erlewine loves the stuff, and shows us why. 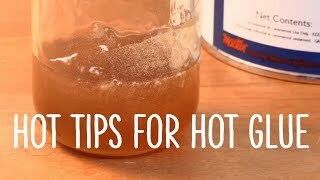 It has to do with the hardness, and the ability to heat-and-release a glue joint, and there’s more. Dan tells it better — check it out! 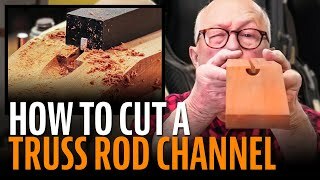 How can a table saw cut a curved truss rod channel? 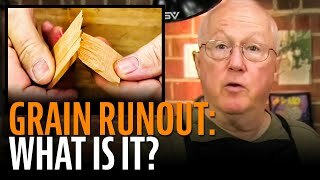 How can a table saw cut a curve? Dan Erlewine has a neat tip and a jig you can make in your shop. The result is a precisely curved truss rod channel just like the one in an original Gibson neck. 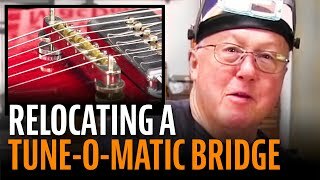 Brazilian luthier Rod Gomes shows Dan Erlewine a neat trick: using low-voltage electricity to clean age-old grunge from a Gibson Tune-O-Matic bridge. A couple hours in Rod’s electric soup, and the bridge is clean! 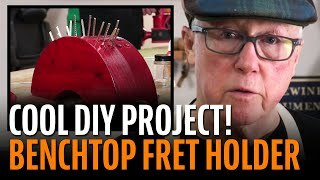 Frank Ford's drill press tricks! 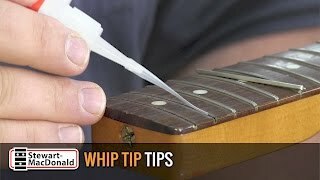 The Gryphon Strings repair crew always has great tips. Today we have some "Why-didn't-I-think-of-that?" 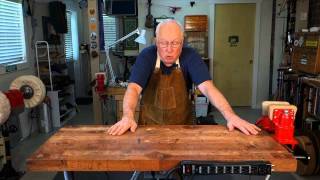 drill press tricks from the master repairman himself, Frank Ford! 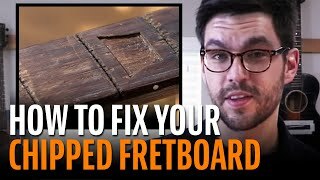 Clean fret slots without wrecking the binding! 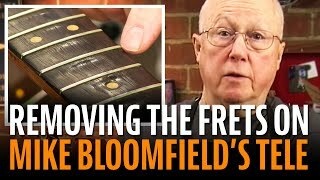 Neat tip from Gryphon Stringed Instruments in Palo Alto: James Hingston cleans out a fret slot on a bound fingerboard without damaging the vintage binding. 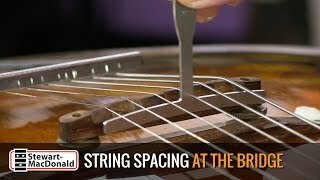 Here's a quick tip from Brian Michael at Gryphon Stringed Instruments in Palo Alto. 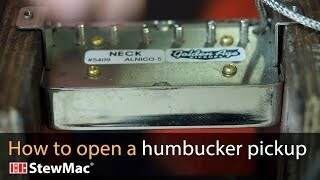 He's got a fast and sure way to open this Golden Age Humbucker, without a soldering iron! Trade Secrets visits RetroFret Vintage Instruments in New York to talk guitars — and groceries. Steve Uhrik, RetroFret’s owner, shares tips for using chemicals you’ll find in your kitchen cabinet! 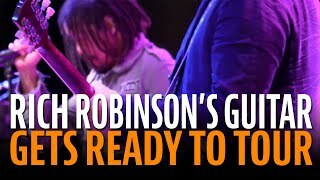 Willie Nelson told Mark Erlewine: “As long as this guitar’s working, I’m working.” In this video, Mark shares insider details you could only learn from the guy who keeps Trigger ready to go On The Road Again. 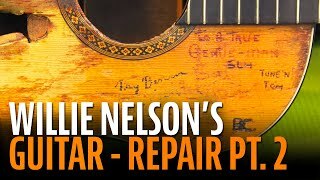 Willie Nelson’s guitar, “Trigger,” is in for repairs at Erlewine Guitars in Austin, Texas. Mark Erlewine shares a closeup look at the famous hole in the top. Mark’s been Trigger’s caretaker for ages, and he gives us the inside scoop on Trigger’s history. 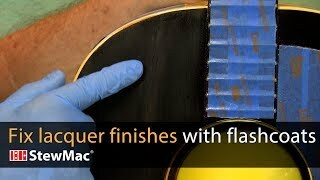 Make new lacquer coats blend invisibly into the existing finish by adding “flash coats” of thinned-down lacquer. Dan Erlewine shows you how. "What was the first work you ever did on a guitar?" Dan visited the Association of Stringed Instrument Artisans get-together in Pennsylvania. It’s fun to hear these startup stories about paper clips, gum wrappers and exploding guitars! 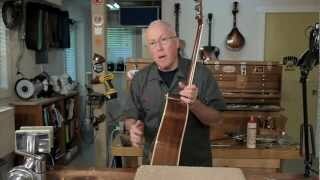 Ian Davlin shows Dan Erlewine an amazing peghead replacement on an oddball 1897 Adams guitar. 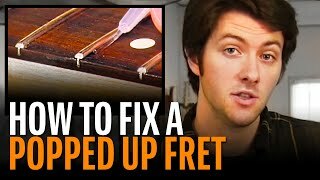 Ian also shows how he files fret ends for playing comfort, and a neat trick for stringing up your guitar. 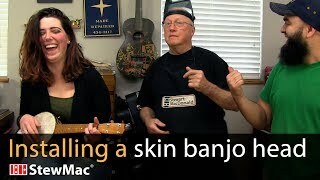 How to install a skin banjo head: Dan Erlewine shows his friend Lauren how to remove and replace a natural skin head on this old banjo-uke, or banjolele. 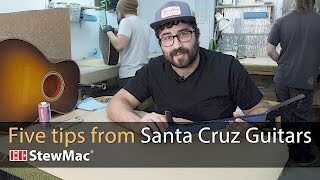 Richard Hoover, founder of Santa Cruz Guitar Company, gave us a tour and we captured tips from the skilled luthiers that make up the Santa Cruz team. 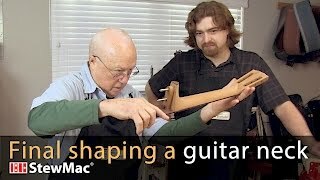 Watching them hand-building exceptional guitars was inspirational! Your first guitar build has a slightly crooked neck! What do you do? Dan Erlewine shows how to recognize and solve this problem. 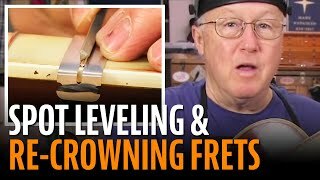 Fred Stuart, one of the original builders at the Fender Custom Shop, teaches Dan Erlewine how he bends herringbone purfling on the tight curves of a Telecaster without breaking it! Joe Etgen is building a guitar for the first time, working down in his basement. Working alone on StewMac's Triple-O kit, he's got the body and the neck in good shape. We asked Joe to take the guitar to Dan Erlewine's shop for a look-over. 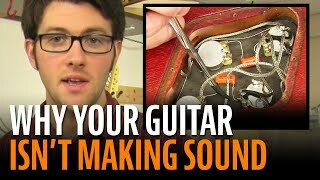 Dan shares some tips you'll want to know when you build a guitar sometime. 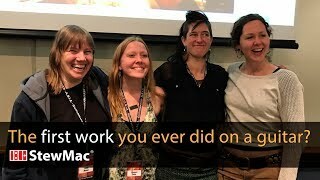 StewMac visited Mamie Minch and Chloe Swantner at Brooklyn Lutherie. 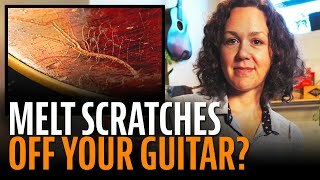 Mamie shared this great tip for making scratches disappear, while renowned guitar photographer John Peden shot closeup photos. 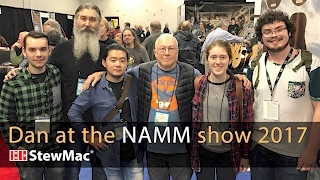 This week we walk the NAMM Show with Dan Erlewine! Dan went to the huge Music Industry trade show in Anaheim and came back with his iPhone full of fun video! New York Guitar Repair is a one-man shop, operated by Evan Gluck. Evan serves a steady stream of customers, working out of his apartment on New York’s Upper West Side. Check out his super-efficient setup! 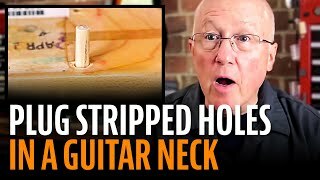 A hard knock on a strap button will crack an acoustic guitar’s tailblock. Alex Whitman at TR Crandall Guitars in New York City shows a clever way to close that crack for gluing! Dan Erlewine collected this Trade Secret at their repair shop. 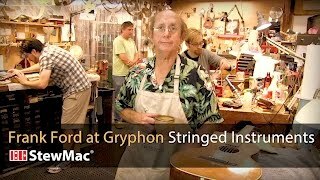 StewMac visits guitar maker Maegen Wells of Forestville, California. 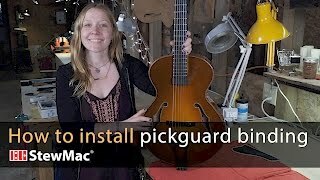 Maegen’s specialty is building archtop acoustic guitars. 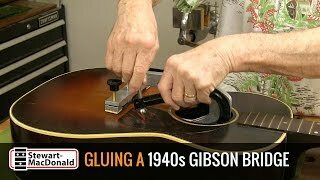 Using a 1940s Gibson as an example, she shows how to create a beautifully bound tortoiseshell pickguard with black/white/black purflings. The pearl was in the way! Working on this fine, pearly Martin D-45, Dan Erlewine needed to spot-sand the fretboard. 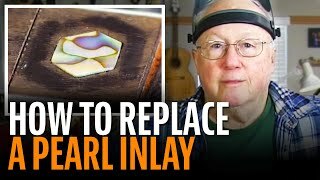 He shows why sanding the pearl inlay at the same time just didn’t work. That inlay had to be destroyed and replaced. 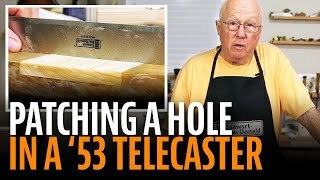 This is an original 1953 Telecaster that someone routed holes in. Looks like it was modified to hold a Bigsby vibrato. Dan Erlewine replaces the missing wood with a darned good match so this guitar can go back on the vintage market. Dan Erlewine's working on a World War II era Gibson flattop. 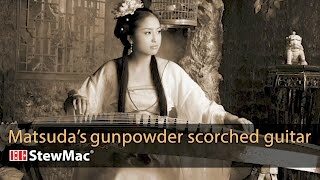 He explains that during wartime, some experienced factory guitar makers were replaced by temps. Maybe that's why this guitar's saddle was in the wrong place. Here's how he fixed it. 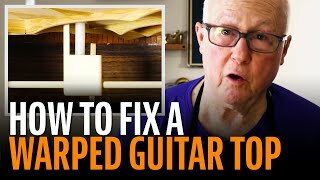 Where to cut the saddle slot on this guitar bridge? Time to install a saddle in this bridge. Where exactly to put it? Salvaging this original Gibson bridge required filling the saddle slot. You can’t assume the original factory placement was correct. Dan Erlewine shows how he located this saddle. The tuners on this Kay Speed Demon are nearly 50 years old, and they're worn out. The old tuners are 6-in-line, but not Fender spacing. 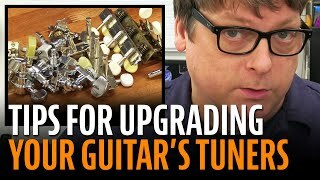 Matt Brooker shows how he's modifying the replacement tuners to fit the guitar. The bridge on this old Gibson has an unusually low, flat profile. 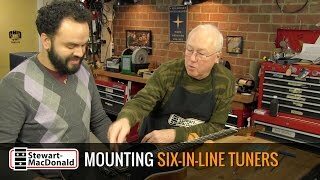 Dan Erlewine shows how he modified a bridge clamping caul for gluing the bridge to the guitar top. Most Fender nuts have a curve on the bottom, so shaping them for a perfect fit is tricky. It can be the toughest part of making a new nut. Erick Coleman shows you some troubles to avoid, and a neat trick for good results. A really unusual guitar just came in to Dan Erlewine’s shop. 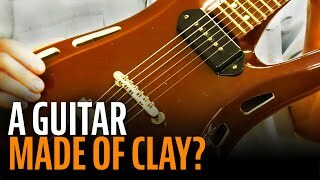 Something Dan’s never seen before: a kiln-fired, ceramic guitar. Erick Coleman helps Dan do some sleuthing on this oddball, and they uncover the surprising story. 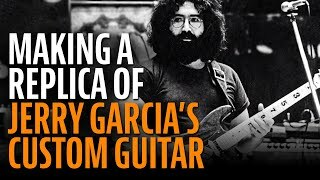 Dan Erlewine made a black walnut guitar for Jerry Garcia in 1970. Recently a Grateful Dead fan asked Dan to make a replica of that guitar. 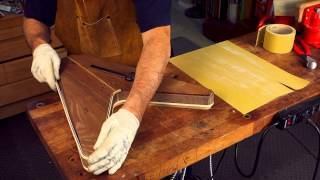 In this Trade Secret, Dan shows how he made the pickguard out of laminated wood veneers. 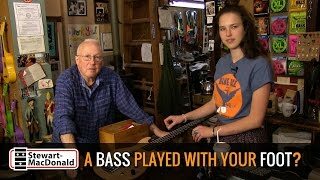 Visiting Blue Eagle Music Shop, Dan Erlewine comes across an unusual instrument from the 1970s: a foot bass. While he’s in the shop, Dan checks in to see what’s happening with Blue Eagle’s young setup tech, Raj. All wired up, but no sound! It can happen to anybody: you do some wiring or change your electronics, then find you’ve got no sound coming out of the amp. In this Trade Secret video, Matt Brooker helps you troubleshoot. 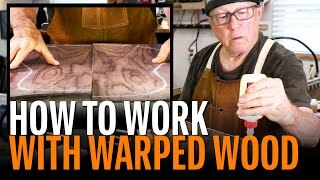 Problem: a WaRpEd guitar top! High action turned out to be a symptom of trouble for this guitar. The owner felt the strings were a little high. Taking a closer look, Dan Erlewine finds that the bridge is just about to pop off! A hump had formed under the bridge, and Dan comes up with an interesting solution. 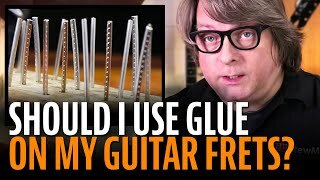 Will you need to drill holes in your guitar if you put new tuners on it? How do you figure out which tuners are an easy fit, and which require more work? What about keeping the old tuners for resale value? We get questions, and Erick Coleman has answers. Two braces popped loose inside this Epiphone acoustic. 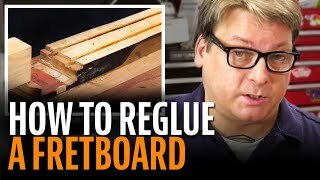 Dan makes some do-it-yourself glue scrapers and shares a ton of ideas. 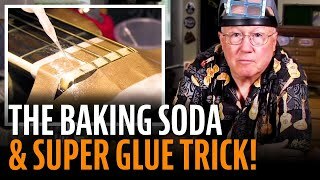 With his brace gluing wedge and see-thru plastic guitar, Dan turns this fix into a guitar repair class! This fretboard binding caught on somebody’s sweater. The missing piece was never found, and the guitar is in Dan Erlewine’s shop for repair. 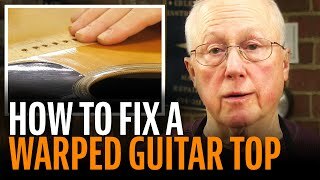 This kind of quick fix is familiar to guitar shops everywhere! Grain runout made this guitar bridge pop off! BANG! While this guitar was being played, the bridge popped off with a sound like a gunshot. 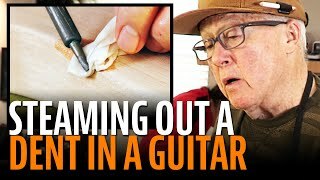 Before Dan Erlewine glues it back on, he explains the likely cause of this trouble: grain runout in the guitar’s cedar top. 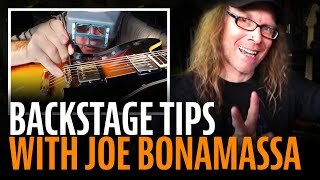 Dan Erlewine visits backstage with the great blues guitarist, Joe Bonamassa and his highly experienced tech, Mike Hickey. 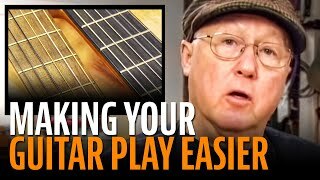 Joe talks guitars with Dan, and Mike shares two guitar setup tips. The string spacing on this old Gibson is uneven. 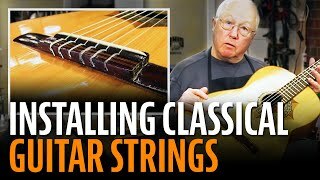 Dan Erlewine shows how he made the E-to-E string spacing wider, then located the other four strings with proportional spacing, not equal spacing. When a local music venue burned down, this Strat was in the blaze. The neck burned like a candle, but Erick Coleman has salvaged the body. 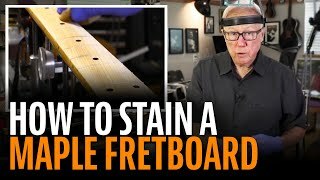 This is a good opportunity to show how to install a Fender style neck. This little parlor guitar was found in a trash can and Dan Erlewine is doing a quick fix on the bridge. The pin holes were entirely chewed up. Dan’s drilling them out with a peg hole reamer then plugging them with peg-shaped plugs of hardwood. Dan Erlewine first saw this Tele back in the 1960s, before Mike Bloomfield recorded with it on Bob Dylan’s Highway 61 Revisited album. That was also before Bloomfield and Dylan were booed for going electric at the 1965 Newport Folk Festival. And before Bloomfield recorded the first Paul Butterfield Blues Band album with this guitar. There’s a lot of history in this Telecaster! Six tuners lined up perfectly straight, and no chips in the finish. The last step in building this beautiful electric guitar is installing the tuners. Brazilian luthier Rod Gomes visited Dan Erlewine's shop to show how he does it. 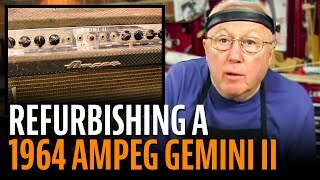 Over fifty years, this amp’s seen a lot of gigs and garages. Dan Erlewine’s fixing it up for a friend who wants to play it again. While the amp’s out for repair, Dan patches the torn up blue diamond tolex. These classical tuners aren’t turning freely — they’re sticking. The holes for the tuner barrels were never drilled quite right, so Dan Erlewine re-drills them, using our Tuning Machine Drill Jig for Slotted Pegheads. High action and a badly shaped nut: That’s the situation with the nut on this old May Bell guitar. 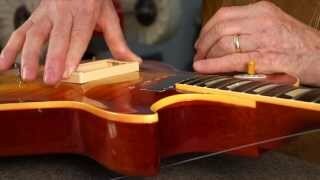 Dan Erlewine lowers the nut slots while also “back filing” the nut so the strings angle down properly to the tuners. A different sort of Erlewine Neck Jig: Dan’s building guitars out of black walnut that he’s saved for forty years. 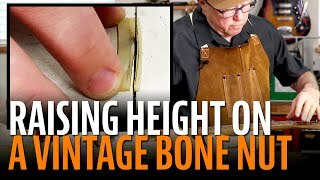 For carving and shaping, he comes up with an easy-to-make jig to hold a neck at just the right working angle. It spins and tilts too! 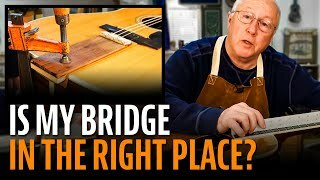 This bridge is in the wrong spot, so the guitar can’t play in tune. Rather than drill new holes in a vintage guitar body, Dan Erlewine comes up with a clever solution. Dan Erlewine’s building a guitar for a tattoo artist. It’s solid black walnut, with a fancy peghead inlay: a tiger image drawn by the customer. 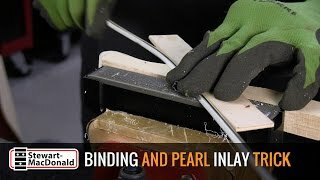 In this Trade Secret, Dan tells about that inlay and shares a neat trick for exactly sizing the binding that goes around the peghead. 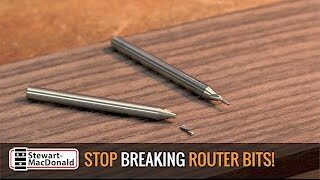 A customer asked me how to avoid breaking tiny router bits. I answer this question from time to time on the phone, and it makes a good Trade Secrets topic. I talked to Dan Erlewine and Dan made us this video. Check it out! Dan Erlewine's got a nasty broken peghead on a yard sale guitar. 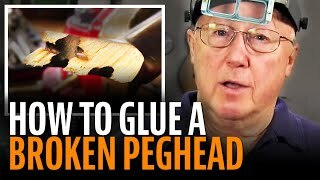 He shows how to fix it, and shares his thinking on which glue to use and how he does a glue test. This is actually a double break needing two repairs at once. Why do you have so many guitars?! Dakota Dave Hull is a pro touring guitarist, a veteran of years on the road. Lugging a half dozen heavy guitar cases, he stopped by Dan Erlewine’s shop and answered some questions, starting with “Why so many?!" 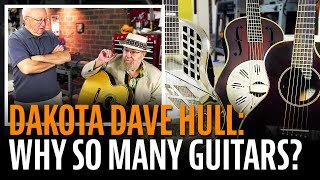 Whether he's performing at the renowned Caffe Lena or at a house concert in the Midwest, Dave carries a lot of guitars. We’re pleased that all of these guitars have Waverly tuners, available exclusively from Stewart-MacDonald! Whip tips are for pinpoint gluing. These are skinny little tube-tips, but sometimes you want them even skinnier. 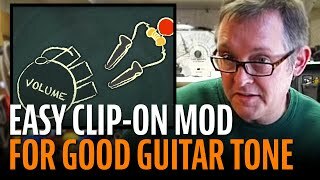 Elliot John-Conry of EJC Guitars squashes, cuts and modifies tips and pipettes to get drops of super glue and accelerator exactly where he wants them. Working on a 1938 Gibson lap steel, Dan Erlewine needs to clamp the neck way more tightly than usual. 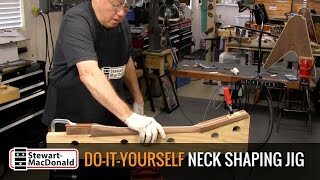 He comes up with a special jig by modifying a Rock-n-Roller neck rest. 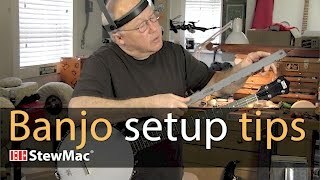 How do you set the tension on a banjo head? If you're more familiar with guitars than banjos, Dan Erlewine has a few quick tips for you. Dirty tuners filled with dried gunk: Dan Erlewine's working on a guitar that's been sitting untouched for over fifty years. The tuners are too stiff to use, but he gets them going again by using heat, naphtha and an injection of lubricant. 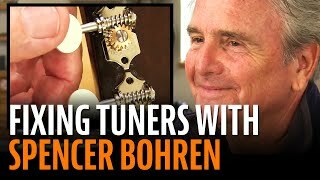 He makes a nifty little tuner-holder jig, too. Replacing a section of this binding from the 1930s requires thicknesses that are no longer available. Dan Erlewine has to custom-size some new wood bindings on his drill press. It's not hard to do: watch the new pieces fit together like a jigsaw puzzle. 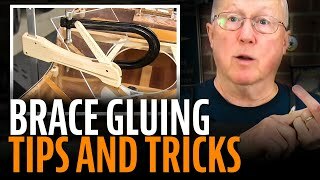 Using three different glues: where and why? 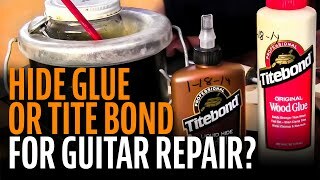 Titebond or hide glue? Hot glue or bottled? Dan Erlewine uses three glues for this repair, and each has different properties. He explains why one glue can't cover all the bases. And he's created some pretty interesting cauls for clamping this job together while it dries! Dan Erlewine went to the Columbus Guitar Show to sell some fixer-uppers. Nobody bought this beautiful 1930s Kay Deluxe; its neck joint problem must have seemed like too much work. The guitar came back home and volunteered for this Trade Secret about making a tiny saw for cleaning old glue joints! Shaping a neck is all about feel. Chelsea Clark learned from Dan Erlewine, and honed her skills on abandoned "project guitars" found on Craigslist and eBay. 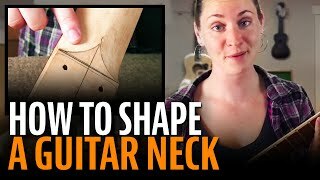 Chelsea shares some great tips on shaping the neck and preparing it for a finish. Fix a broken nut with baking soda? 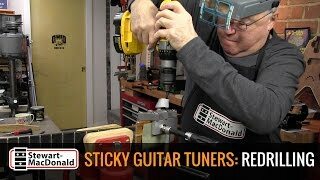 Compact, low-profile guitar repair setup: Dan Erlewine removes the mounting base and bolts his StewMac Guitar Repair vise to the end of his bench, for a new low-angle working style. Also: a quick tour of Dan's customized workbench. 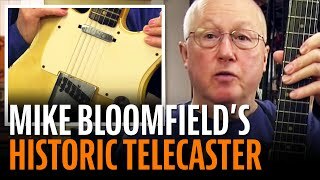 The King of Dieselbilly Talks Tele! 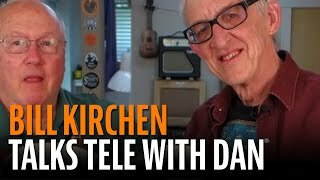 Titan of the Tele: Bill Kirchen explains why he flips his control plate backwards, and shows how he got the famous sounds he recorded on Hot Rod Lincoln. 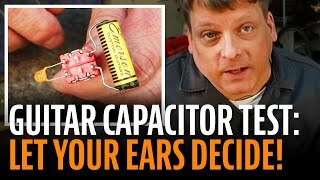 Ever wonder whether a different capacitor would affect your tone? It's between you and your own ears, nobody else can tell you what you hear. Erick Coleman's got a simple way to prove to yourself which cap is the choice for you. 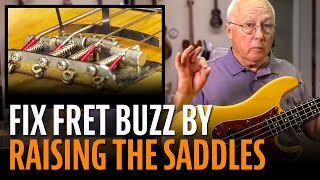 Is this bridge saddle in the right place? 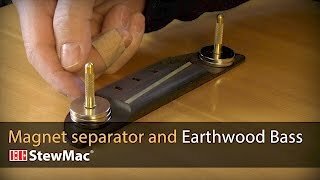 In this Trade Secrets video, Dan Erlewine extracts and replaces a broken screw in a Fender peghead. The simplest custom build ever? Erick Coleman builds a custom guitar that's even simpler than Bo Diddley's rectangular axe. 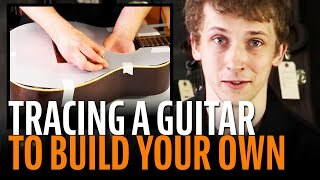 It's a great example to show the basics of building an electric guitar. 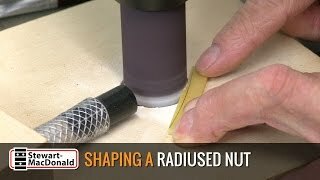 Tips for fitting a shaped and slotted nut. 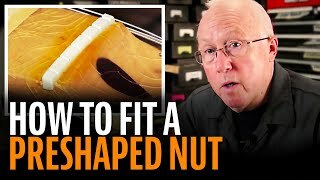 Dan Erlewine tries a preshaped nut in his own Fender Strat: it's so easy "it's almost like cheating!" 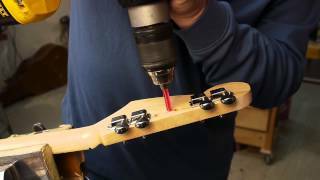 Dan Erlewine shows what he does when a bolt-on neck's mounting bolts aren't holding tight anymore. Erick Coleman opens up a 1973 Fender Musicmaster Bass and is surprised by what he finds! 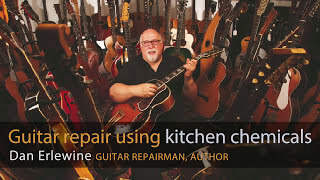 Dan Erlewine fixes a 1980s Harmony guitar with a bridge that's falling off. To see how fast he can do this repair, Dan decided to play Beat The Clock! 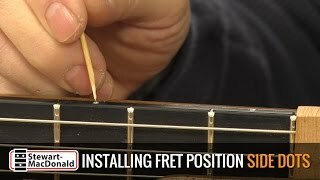 A sign of truss rod trouble, and an easy solution. Dan Erlewine with a common truss rod problem: an over-adjusted rod that just won't work anymore. Luckily, there's an easy fix! 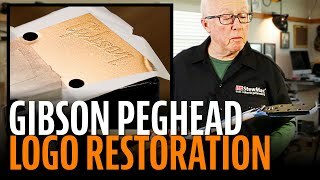 Semi-hollowbody crack repair: Dan Erlewine compares Gibson's ES-350T to their more famous Byrdland. Includes 1955 catalog descriptions of these two great Gibsons. Erick Coleman installs P-90 soapbar pickups into the dogear pickup frames on an Epiphone Casino. It's an easy upgrade that makes a big difference. Dan Erlewine has a Gibson doubleneck with a broken truss rod -- a problem that sends lots of guitars to the trash can. What will it take to rescue this one? The answer might surprise you: it takes 65 minutes of work. Does this bone nut fit my guitar? Erick Coleman answers a question that's come up a lot lately: how to find the right size replacement nut. He introduces a new Sizing Sheet that makes measuring easy for anybody. Where to put the workbench in your shop? And where to put the vise on that bench? Dan Erlewine's helps a friend with those questions in his new garage workshop. 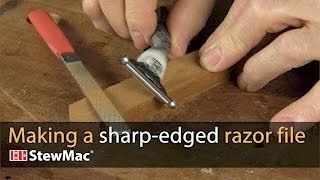 Dan Erlewine shows how to put a round peg in a square hole, literally. 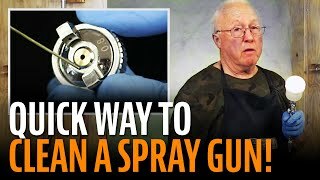 Check out this handy drilling idea, and you'll probably find lots of uses for it in your shop. 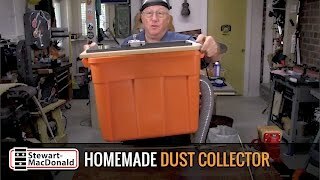 Electronics cleanup in a beautiful '58 Gibson: "Little Lefty"
Inside a "miniature Les Paul case," Dan Erlewine finds a beautiful 1958 Gibson in 3/4 size. Cleaning the electronics gets it playing again. 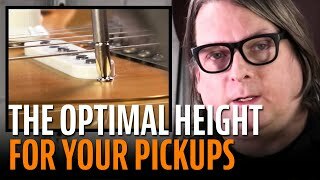 PLUS: Dan shows his shop-made "Guitar Testing Gizmo"
Erick Coleman shows tricks you can do with those four colored wires coming from your humbucker pickups. Dan Erlewine has a Martin D-35 with a loose brace inside, and it rattles. 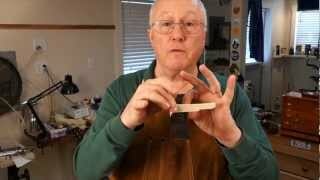 He shows how to make your own brace-fixing gizmos for a clean repair. Erick Coleman's 1967 Melody Maker is getting too old and pricey for knockaround club gigs. With some simple mods to an affordable new Gibson, he's made himself a good backup guitar. Taking a Les Paul from Nashville to Kalamazoo by way of the Tune-o-matic Bridge: Erick Coleman swaps the factory Nashville bridge for a 1950s-style ABR-1 Tune-o-matic. Erick Coleman finds that a 1970s Hondo is really well built, but the parts weren't road-ready. A couple of fixes, and this guitar's ready to tour the world! 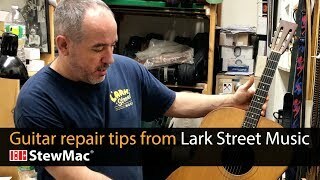 How to fix this guitar if my elbow's stuck in the soundhole? 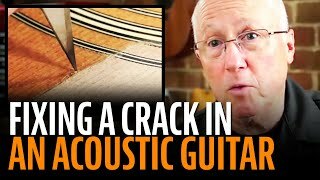 Dan Erlewine needs to fix the inside of a classical guitar, but can't fit his arm through the soundhole. Thinking outside the box, he finds the solution to this puzzle! 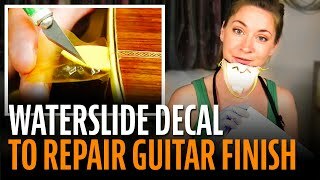 Christine's inexpensive guitar needs a bridge repair: fix it or pitch it? 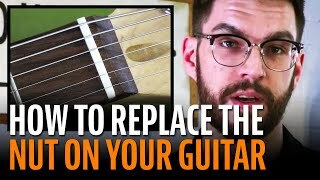 Should you put $100 worth of repairs into a guitar you can replace for $200? Erick Coleman tells why his answer is yes. And he hands over the repair tools to Christine, who works in StewMac's office. 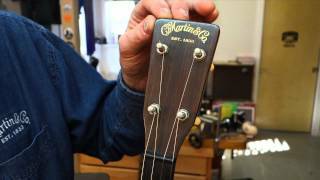 Erick Coleman can't find tuners to fit a Martin mandolin -- so he modifies 12-string tuners to do the job! 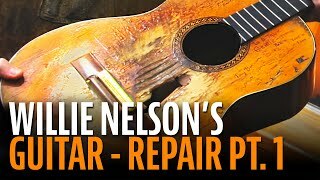 Erick Coleman fixes a slipped neck joint on a beautiful Gibson ES-125, showing what can happen to glue joints that get too hot. Build this bypass pedal to turn your stompboxes OFF! Erick Coleman's got a simple wiring project that most guitarists need: a true bypass stomp switch to take your effects pedals in/out of your signal chain. Keep that body in shape! Go-bar/neck jig gluing rig. Dan Erlewine has to leave a guitar body with the back off for months. How to keep the sides from going out of shape during this time? Believe it or not, the answer is blue foam insulation from the home improvement store. Make custom labels for your guitars! Dan Erlewine's making a forgery of an old Gibson label, using his brother as an accomplice (he's got a good excuse). 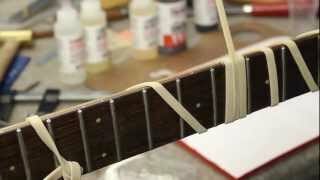 While he's at it, he shows how you can make new custom labels for your own guitars. 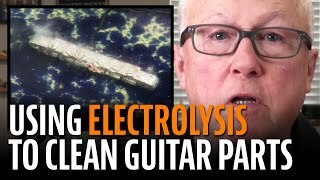 If you sometimes think of making a custom electric guitar, Erick Coleman has tips to make one part of the process a lot easier. 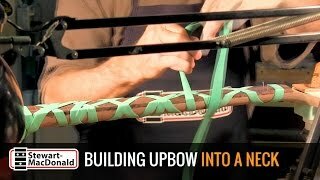 Here's how to rout the neck pocket and control cavities so they look as good as a factory build. You need a bag of clothespins for your workshop! Dan Erlewine modifies wooden clothespins for a bunch of jobs around the shop -- today it's gluing kerfing into an old Gibson. While he's at it, he plays Santa Claus and offers a make-it-yourself holiday gift idea. Rubber bands as clamps: super-useful, and cheap! 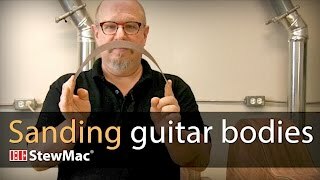 Erick Coleman has a simple tip that saved a lot of time at the recent Purdue Guitar Workshop: rubber binding bands make great clamps! They're for lots of things -- check out the examples in this issue. 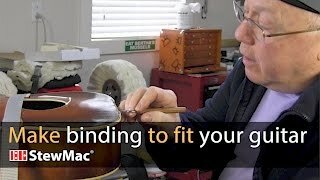 Erick Coleman fixes a chip on a 1955 Gibson TV Model, which means figuring out how to recreate that unique see-through yellow finish. 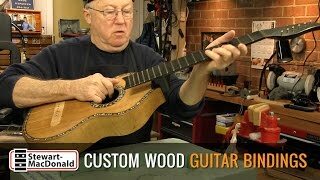 How would you reach inside a guitar to do this gluing? Dan Erlewine's got a puzzle on his hands: this guitar's center strip fell out along with the braces. These parts are meant to be glued BEFORE the guitar is assembled. 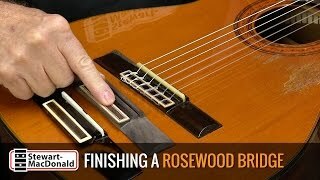 How do you reach inside to do this on a completed guitar? Dan Erlewine is missing one last part needed on a 1917 archtop Gibson. It's a long gone, irreplaceable pickguard support that he recreates from found material in his shop. 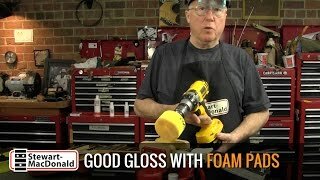 A useful tip for fabricating modern plastic parts, too! Dan Erlewine shares a tip for putting a rounded shape on bone saddles: use the notch in one of those utility knife blades in your toolbox! Erick Coleman just went guitar-shopping and picked up a used Gretsch Corvette from 1963. It needs a little fixup/setup. This Trade Secrets is about tweaking your pawn shop prize. 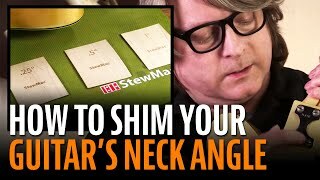 Dan Erlewine's got a wobbly neck, but not for long: here's a fast way to tighten the screwholes in a bolt-on neck. Erick Coleman shares some tips for modifying your guitar wiring: easy mods that give you a new tonal range. Dan Erlewine got a blast from the past in his shop recently, and before the dust settled he got another one! He's working on two Gibson L-1 archtops from 1917, and they both have the same trouble: too-tall bridges and too-high action. 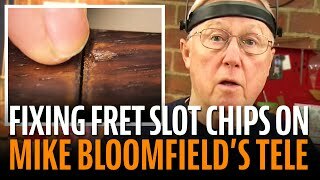 Dan Erlewine finds an old bridge to fit a 1950s Gibson, but will the saddle slot be in the right place? He measures and calculates, but still wants to prove it's in tune before gluing. Here's how he did that. Dan Erlewine's working on great old Gibson L-1 with back problems. The challenge: how to fix this on a budget today, in a way that won't interfere with more thorough repair work in the future. 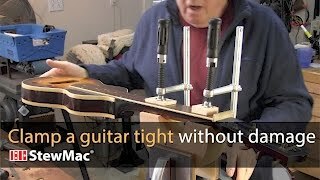 Erick Coleman shows how he made a surrogate body for neck and fret work, following the free plans online at stewmac.com. Guitar maker Todd Sams directs the production of our StewMac guitar necks, and he uses the necks in his own custom Sams guitars. Todd shows how to spend twenty minutes final-shaping a neck to get it to look and feel exactly right. Dan Erlewine says he has the last working pair of X-Ray Specs on Earth, and he won't share them. At least he has some alternatives for the rest of us. A knife in the back! 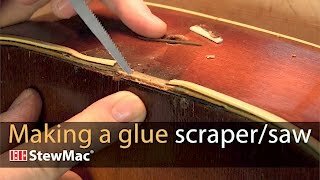 Popping the back off a 1929 Gibson L-5. Fishing a volume control out of a semi-hollowbody for soldering. Erick Coleman's got a guitar with one dead pickup and a volume control that spins around when you turn the knob. That's trouble. And it's inside a semi-hollowbody guitar -- that's double trouble! 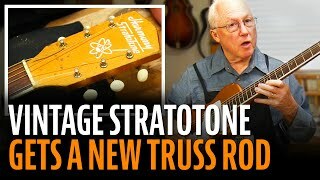 Tune-O-Matic setup: is the trouble with the bridge or the neck angle? 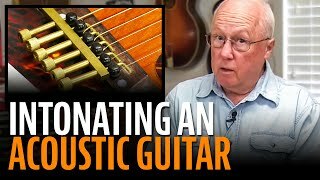 Dan helps the local music store with a customer complaint about a Gibson Tune-O-Matic bridge setup. Who's to blame here? 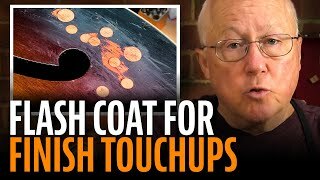 While Dan Erlewine gives a relic finish to new tuners on a 1945 Gibson J-45, he talks about making money with a guitar repair business. Vintage retainer wire: searching Nashville for one little guitar part! Dan and Leon Rhodes need a retainer spring for a vintage Gibson bridge. Visiting repair shops in Nashville, they find out how to make their own. Making a custom fire stripe pickguard to fit a baby guitar! Dan Erlewine's in his guitar shop (or is it a toy shop today?) 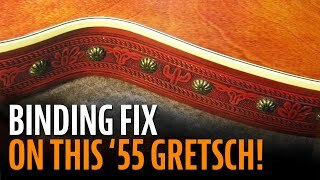 making a custom "fire stripe" pickguard just like the one on his 1939 Gibson J-35. 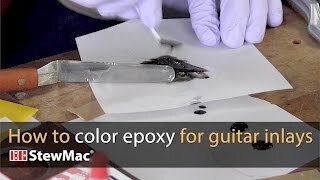 He shows how to make a custom pickguard in any color variation you like. 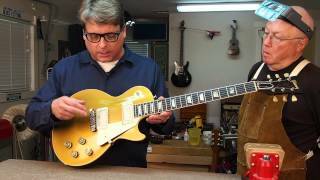 Dan Erlewine shows a before and after of a 1958 Gibson that's (barely) survived a house fire. It needs a new nut, and he's using the Nut Slotting Gauge to get it right the first time. Hardshell cases are sold for a few of the most common guitar sizes, but what if your guitar is a different shape? 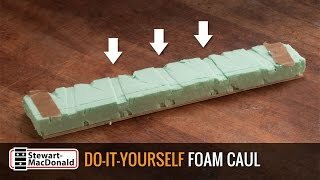 Todd Sams shows an easy way to make a great custom case. Erick Coleman helps a serviceman put together a complete carry-all kit for service in Iraq with the Air Force Band. Dan Erlewine's got a repair that needs repairing again. 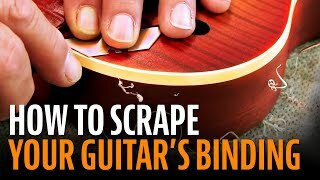 Working inside the guitar body is too tight for comfort, but Dan shows some tools and tips that make it easier. Dan Erlewine faces facts: too many tools and not enough workspace. He clears the decks and sets up a whole new floorplan using two ShopStands. 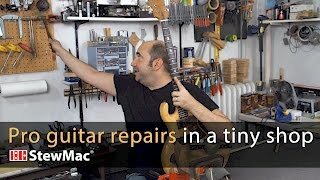 Erick Coleman finds a new use for StewMac's BridgeSaver: quickly repairing a hole in the side of a guitar. 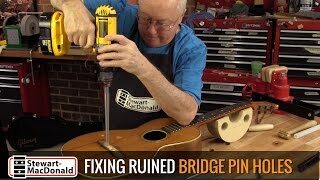 Fixing a 1937 Martin bridge. The first step is fixing a sandwich! Dan Erlewine's got an unusual bridge problem and an unusual repair. Erick answers a customer question about reversing a humbucker's pickups, and finds that the hardest part is getting the cover off the pickup! Someone shaved down the saddle on this great old Martin until there's barely a nub showing above the bridge. It needs to be removed, but it's glued in and so low you can't grab it. Dan Erlewine shows how to solve this problem. What's the problem with swapping Fender and Gibson bridges? 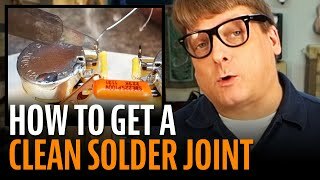 Erick Coleman shows how easy it is to do a pro-quality soldering job. Why you might need a new nut: Cracked nut. Poor string spacing. Hollow plastic nut sapping tone. Nut slots are too low, causing fret buzz on open strings. If you're nervous about replacing the string nut you've got company, and this week Erick Coleman shows that making a nut is no big deal. You don't have to have a locking system to have a tremolo stay in tune. Erick Coleman shows tips for keeping your tremolo tuneful. Dan's been using repair magnets in his shop for a dozen years, and they're doing tricks all over his shop. Dan Erlewine tells what happened with two guitars sent to him recently by Carlos Santana. Where's the best spot for your strap button? Dan Erlewine raises a simple question that comes up often in any repair shop. Is there a best spot for your strap button? Single-coil buzzkill: the why and how of electric guitar shielding. Erick Coleman talks about the causes of buzzes and electrical noise, and how to beat them. 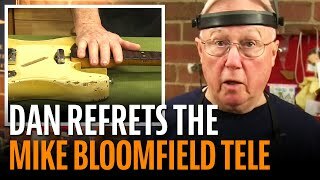 Dan Erlewine shows why he uses scraper blades instead of sandpaper for the final smoothing before the finish goes on a guitar. Erick Coleman's finished tweaking a budget-priced Les Paul copy. It plays great, but one last thing's needed: making it look more like Jimmy Page's 1970s original. Erick Coleman talks about why each guitar he works on gets six custom-fit bridge pins. It's all about hardware coupling, energy transfer, and tone. 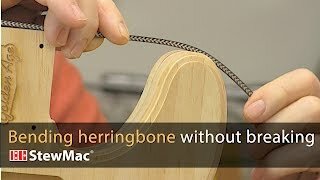 The best nut-making material: Bone for Tone! Customers ask, "What material makes the best string nut?" Erick Coleman's says it's Bone for Tone. 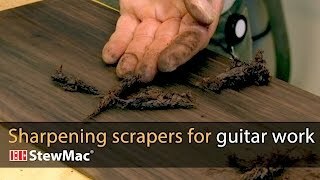 Erick Coleman shows why brushing your guitar saddles is as important as brushing your teeth! Doug Unger restores and reproduces exquisite turn-of-the-century 5-string banjos and early archtop mandolins. Doug shares a lesson in pearl engraving with Trade Secrets readers. Dan Erlewine's got an unusual 1951 guitar: a National with a Gibson body. The old pickguard came off in an earlier Trade Secrets, and now the new one goes on: it's an oddball pearloid guard that's worth checking out! Plastic nuts are high-speed and low-cost! Dan Erlewine races the clock to show that plastic nut installations are quick and profitable! A badly broken neck on this Martin D-35 almost goes unnoticed, and the repair leads to an innovative do-it-yourself jig. 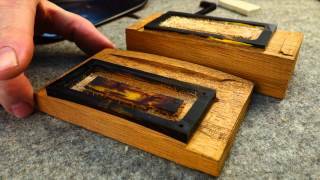 Dan Erlewine explains how he chose the gluing method for this repair. 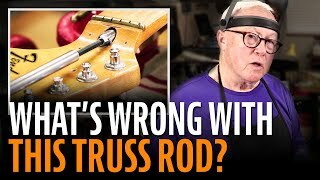 Don't be nervous about adjusting that truss rod! 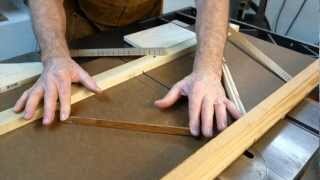 Erick Coleman shows how quick and easy it is to evaluate a neck and adjust the truss rod. 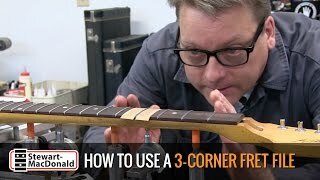 Erick Coleman shows the steps involved in replacing a Fender-style neck, with tips for tuner installation, truss rod adjustment, and correctly positioning the neck. This week, Dan Erlewine's got two pickguard removals in his shop. 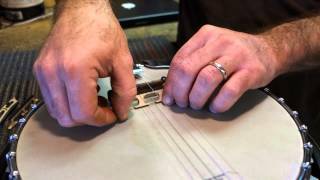 The Martin D-18's pickguard has cracked it's top, and Dan shows how a pickguard's supposed to come off. The "Gibsonational" is another story: this pickguard is nothing but trouble! 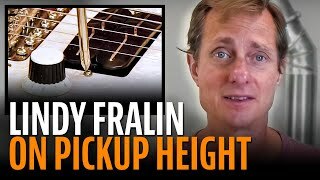 Erick Coleman uses Kevin Ryan's proportional string spacing rule for more jobs than Kevin ever expected: 12-strings, mandolins, bridge saddles... Plus: an explanation of the difference between equal spacing and proportional spacing. When installing new tuners leaves old screwholes showing on the back of your peghead, here a 1-2-3 step method for making them disappear. 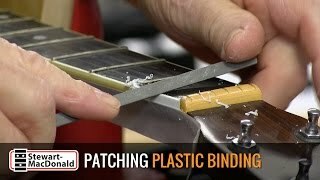 Dan shows us a Martin D-18 with a nasty looking broken bridge, and explains his technique for making a replacement that looks vintage but is stronger than the original. This week, Erick Coleman steps into the ring for Round Two in the Battle for Better Tone: his secret weapons area lightweight Tune-o-matic bridge and tailpiece. 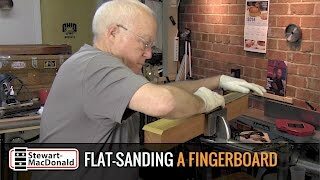 Dan Erlewine's getting fancy with his Sanding Station: with his shop-made jig, he's making better bridges than he ever has before. 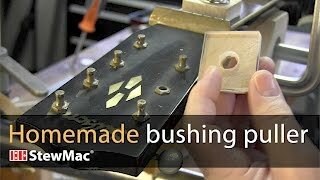 This week Dan shares two tips for installing humbucking pickups, including a simple jig you can make yourself. Also, he repairs a broken pickup ring that his customer thinks is worth $10,000! 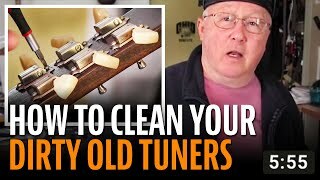 This week, we're in Dan's Guitar Garage for a Tune-up Special: how to clean and lube old guitar tuners, and get them working smoothly again. 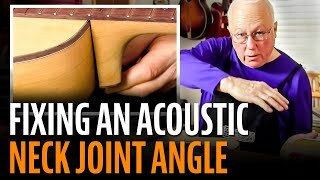 Did you ever try to fit a bridge to an archtop guitar or mandolin? (Or a violin?) This week Dan Erlewine shows how it's done with sandpaper and a bridge-fitting jig. 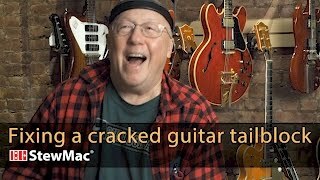 Upgrading the electronics in a "Less Paul"
Erick Coleman answers tech questions from StewMac customers, and here he answers a popular one: How do I soup-up this low-priced guitar? 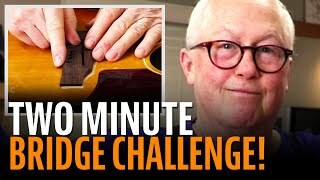 This week, Erick Coleman shows how to add 50 years in 30 minutes: he makes a new set of tuners look like they've been around since the 1950s! 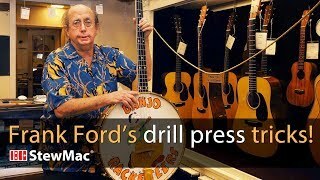 In this issue of Trade Secrets, Dan makes his Guitar Repair Vise sit up and roll over. Who knew cast iron could be so flexible? This week in Trade Secrets, Dan runs into pickup trouble and turns to Lindy Fralin for help. 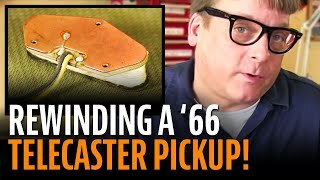 The simplest possible solution keeps a P-90 pickup from 1957 from falling apart. This week, Dan's got a 1957 Les Paul Junior in his shop. It hasn't been out of the case in 25 years, and the tuners are unusable. 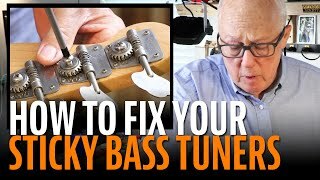 Here's how to put new knobs on old tuners. Ever have trouble installing an endpin jack? 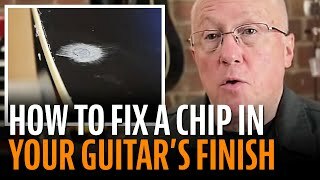 Did you chip the guitar's finish, or drill the hole out-of-square? 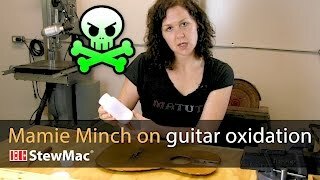 Did you goof up on a customer's guitar? You'll want to read this week's Trade Secret from Dan Erlewine. 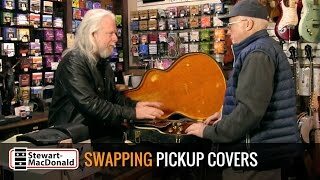 This week, Dan Erlewine and Erick Coleman revive a beautiful old Gibson F2 mandolin that's become warped after nearly 100 hot summers stored in the attic. In Trade Secrets this week, Dan Erlewine shows a trick for installing side dots that are perfectly positioned: he modifies a hardware-store drill bit to make the job easy. 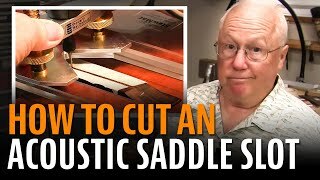 This issue shows how to locate and cut the saddle slot for an acoustic bridge. In this week's issue, Don MacRostie shows Dan Erlewine a neat trick for making custom wood bindings: using an upside-down Dremel tool. In Trade Secrets this week: Did you know you can plane wood on your drill press?